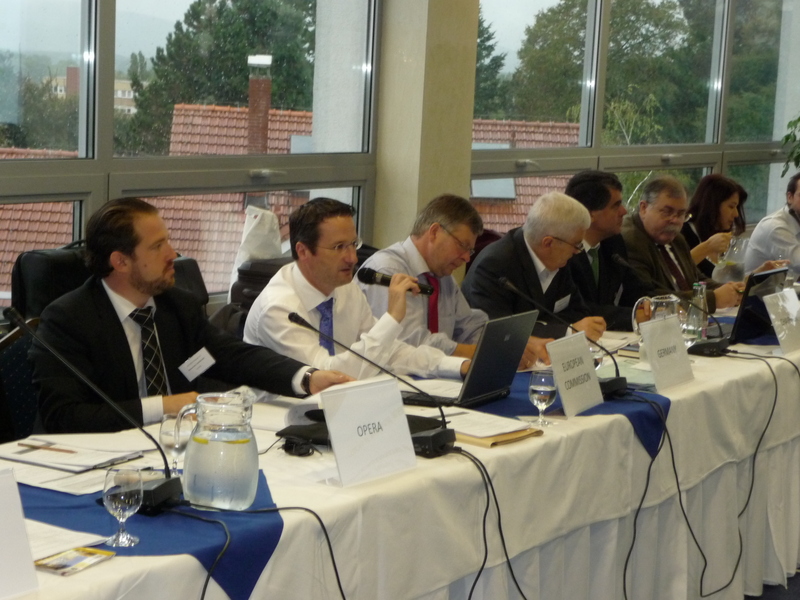 The fifteenth CEUREG Forum was organized this year in Bratislava. The forum gathered representatives from the regulatory authorities of Central and Eastern European countries, the private sector as well as a representative of the European Commission, European Crop Protection Association and OPERA Research Center. The forum consisted of four sessions where different topics of high interest on the field of agriculture were discussed. The first session referred to the Regulation 1107/ 2009/ EC that replaced the Directive 91/ 414/ EC. The representative of the Commission presented the first experiences from the application of the Regulation while the reaction of the Member States expressed the difficulties that they face in its implementation. One of the common problems was managing the work load generated by the application of the regulation. Another problem that appears refers to the difficulties on interpreting the regulation. The facts that the existing standards within the Member States are different, as well as the short time for practical experience are two elements that make more difficult the adoption of the regulation. The second session was about Directive 2009/ 128/ EC Sustainable Use Directive of pesticides. The representatives of the Member States presented the current situation in their country regarding to the difficulties they face on the transposition of the Directive to national legislation and on the drafting of the National Action Plans. Some of the topics that were put on the table by the Member States were related to implementing Integrated Pest Management and specific measures to reduce risk and to monitor progress. Furthermore, the need of harmonized Risk Indicators and their place in the National Action Plans was an issue. There were given some examples regarding the possibility to use a selection of social, environmental and economic Risk Indicators. The overview of the current situation in the CEUREG Region States as to the Integrated Pest Management and organic farming was discussed at the third session of the forum. There were presented the general provisions of the Sustainable Use Directive; the general principles of Integrated Pest Management and the state of art regarding to the above mentioned practices in relation with the future steps that have to be followed. Crop specific guidelines on IPM and successfully implemented elements of the Sustainable Use Directive in some Member States as well as some plans to promote IPM were on the table. The fourth and last session of the forum was focused on an update on the international, regional and relevant country developments since the previous CEUREG forum. Firstly, were presented the outcomes of the 11th International HCH and pesticides forum that took place in Azerbaijan in September of 2011. The OECD pesticides’ working group objectives and activities were also a subject in the program. The debates were focused on the strategic approach in pesticide risk reduction and the possible elements for a vision for the next decade. A survey that took place during the 15th CEUREG Forum on the definition and regulation of “other products” has provided some relevant information on how different countries manage this issue. Mainly, there were mentioned the regulatory status; the areas of assessment and the plans to change the current status in each country. Finally, candidate countries to European Union presented their progress report on the harmonization procedure, problems experiences and expectations regarding to the development in pesticides registration in their countries. The 15th CEUREG Forum closed with drafting the final document where the conclusions of the two day meeting were highlighted and confirmed. The next CEUREG Forum will be organized in Vienna in October of 2012.